CQMS’17 is Ireland’s Construction and Quarry Machinery Show and it takes place in Molloy’s Quarry, Tinnycross, Tullamore, Co Offaly on April 21st and 22nd 2017. 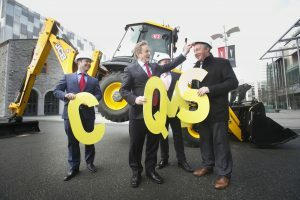 This demonstrative bi-annual show, supported by the Construction Industry Federation and AIB is a hub of innovation and new technology covering 100,000 square meters with 200 exhibitors, 8,000 expected visitors, 2 live demonstration zones, a new machinery launch zone, factory visits, the world famous JCB Dancing Diggers and much more. Ireland is a hub of quarry equipment manufacturing and engineering. 65% of the world’s crushing and screening equipment is produced in Ireland so it makes sense for this International show to take place on Irish soil. Among the 8,000 visitors will be industry professionals and trade delegates with a large overseas delegation. Factory visits to equipment manufacturers in Ireland North & South will be facilitated for international visitors. The show will also appeal to families and general public with an interest in mega machines, dancing diggers and the spectacle of over €70 million worth of equipment. Brian Coogan, CQMS’17 Event Director said “There has never been a more opportune time for this show. CQMS’17 presents us with the opportunity to showcase Ireland’s global dominance of the quarry equipment manufacturing sector. Thousands of national and international construction and quarrying professionals will attend this event which presents Ireland as a centre of excellence in engineering and manufacturing”. According to AIB analysis the level of activity in commercial and residential development sectors has increased significantly over the last year with turnover for companies in the sector increasing nearly 15% year on year. All indicators are that 2017 will see continued growth with value of output expected to grow by up to 20%. Among the confirmed exhibitors are JCB, Kubota UK, Geith International, Topcon, Atlas Copco Construction & Mining Limited, Jim Macadam Equipment/Case, BAM Contractors, Finning Caterpillar, Palfinger Ireland, Sandvik, CDE Global, Renault Trucks Ireland, Tesab, MacHale Plant Sales and many more. CQMS’17 will offer buyers and sellers an opportunity to see machines at work with two large live demonstration zones as well as a new machinery launch zone with latest technology and innovation from manufacturers and a unique opportunity for international buyers to do factory visits. Confirmed headline sponsors are AIB Finance & Leasing and Total Lubricants, represented by their Irish distributor partner Finol Oils Ltd.